Controversy. Erika Brockman believes that the population seemed to be anesthetized and now is becoming critical. Julián Ibarra sees the breakdown of government. The considered “economic bonanza” experienced by the country, no longer seems to have more weight to be used as a flag for the ruling Movement Toward Socialism (MAS). Recognized political analysts believe that the various corruption cases that have involved the government of Evo Morales, far outweigh the economic bonanza that MAS emphasized in various parts of the country and abroad. Decreasing acceptance. Political scientist Julian Ibarra, said that economic stability in the country, was enough to highlight the MAS management on more than one occasion, but at the same time all this time, there has been a general wear to the Bolivian population . He noted that the facts of corruption were the main reason for the departure of some MAS supporters, who chose to continue with other ways to not be part of these irregularities have been reported. “It is natural wear of governments, as is also natural to drop in popularity, the discontent of the population has increased. Corruption is a direct involvement to MAS” he said. Ibarra believes that these acts of corruption directly affect the MAS with large disadvantage in the referendum. Own general benefit and personal prejudice. The former vice president of Bolivia, Victor Hugo Cardenas, considered precisely, the economic boom in the country does not depend on the government in particular, but the raw material that produces Bolivia. He recalled that the reduction in income to the autonomous state universities and municipalities and governorates, are a sign that society is beginning to be affected. “The economy affects society and not the government, and now the economic issue is no longer benefiting the central government, does not serve at all, now it has more weight corruption and new cases that shocked the population in recent times” he added. Population pause. With a similar position political analyst Erika Brockman, who noted that in her opinion, the Bolivian population was “numb” with little economic improvement in the country and as far diminishes the bonanza, she manifested that the highlight acts of corruption start to shine. “The facts of corruption were still happening, but it seemed that people did not care, but now begin to take hold these controversial cases, the tolerance level has declined and it is not because we are in crisis, but people are tired and begins making loud criticism of the irregularities observed,” she said. 1 Trucks smuggling. A convoy of 33 trucks evaded border checkpoint in Pando. In this fact the minister Juan Ramon Quintana got involved. 2 Barges. Economic damage to the state in the case of the purchase of 16 Chinese barges and two tugboats was induced. 3 Santos Ramirez. The biggest corruption scandal in YPFB, robbery and theft of $450,000 uncovered a web of corruption in implicating the president of the Senate and senior leader of the MAS, Santos Ramirez. 4 Bolivia Roads. It was discovered that unnumbered toll tickets were sold, causing considerable economic damage to the state. 5 Customs. President of Customs, Marlene Ardaya, discovered that her predecessors set up a network of corruption with bonuses, irregular appointment, luxury travel. 6 Oestreicher. The illegal sale of 13,000 tons of rice and 273 head of cattle from high genetic quality, were seized from American Jacob Ostreicher, a pot uncovered corruption in which officials were involved the Ministry of Government. 7 Air Catering – BOA. Crime of “influence peddling” in state BoA, after demonstrating that the company Air Catering SRL was directly awarded a contract of more than 26 million Bolivians. Vice President Alvaro Garcia Linera was involved. 8 Indigenous Fund. It was considered the largest corruption fact during the administration of Evo Morales, until two weeks ago. In this case it involved the former Minister Nemesia Achacollo and MAS leaders and other personalities close to the president. 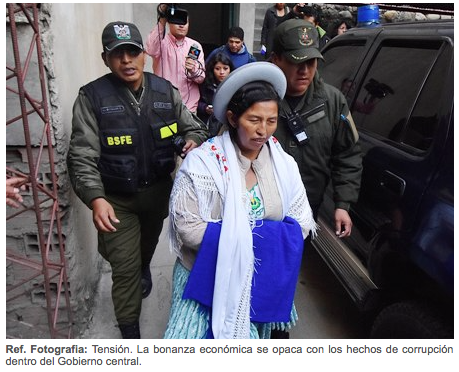 It took a while for most Bolivians to really see the face of the ruling ochlocracy… I never doubted that the coca grower leader was going to end like this. What I despise the most is that he came to power at the best possible economic time in our history. He did not only received the loan forgiveness from most donors but also great prices on our exports… without him having anything to do about these!! He wasted over $150 billion dollars in stupid, illogical soccer fields and spent millions of this personal security, the building of a palace, countless international and national trips to portray the lye! Like Venezuela and the rest of the Alba, they showed as the saviors of their people and just planted resentment, hatred and bigotry. To date, more than 600 Bolivians had to flee the country out of political persecution, more than 60 people were killed as a result of his incompetence, like the six people who died last week in El Alto. His government spends considerable amounts of money on propaganda, selling his spiel to the world, and that is precisely why I translate news like these, so the world know the truth of this petty government! This entry was posted in Bolivia, Business, Crime and Violence, Economics, Energy, Mining, Politics, Social Unrest and tagged bad politics, corruption in public office, demagogue, democracy in peril, Ochlocracy, public policy failures. Bookmark the permalink.